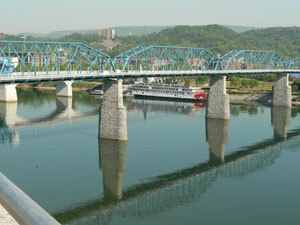 Chattanooga is home to over 160,000 people and is nicknamed “Scenic City”. There are numerous advertising opportunities throughout the city starting with the many colleges located within the city. Out-of-home advertisements can be utilized by placing them on the campus of The University of Tennessee-Chattanooga or Chattanooga State Community College. Also target your audience with outdoor billboards or digital signage advertisements near the two lakes where boaters flock to. These are Chickamauga Lake and Nickajack Lake. The roadways servicing the city also provide billboard possibilities. Billboards on I-24, I-75 or I-59 would generate high traffic exposure of your business. Zip Codes: 37401, 37402, 37403, 37404, 37405, 37406, 37407, 37408, 37409, 37410, 37411, 37412, 37414, 37415, 37416, 37419, 37421, 37422, 37424, 37450, 37499.